Deputy Senate President Ike Ekweremadu. 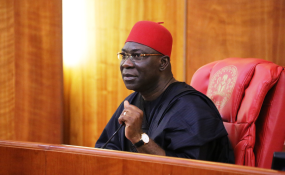 The Federal Government has approached the Federal High Court, Abuja with a motion exparte seeking an order of temporary forfeiture of 22 properties allegedly linked to the Deputy Senate President, Ike Ekweremadu. The motion which was filed yesterday by Festus Keyamo (SAN) for the Special Presidential Investigation Panel for the Recovery of Public Property, accused Ekweremadu of not declaring the properties in his asset declaration form with the Code of Conduct Bureau (CCB). FG said a preliminary investigation revealed that a prima facie case of a breach of Code of Conduct for Public Officers has been made out against Ekweremadu. The motion has not yet been assigned to any judge.